Allen Webster was among the pitchers in recent years who failed auditions in the Red Sox’ starting rotation. All winter and into the early stages of this season, the conversation about the Red Sox’ rotation has been dominated by what the team didn’t add. Yet while the decision not to acquire an established ace has been placed under a microscope, there’s another critical element in what the team did not add even as it turned over four rotation spots in a five-month span. 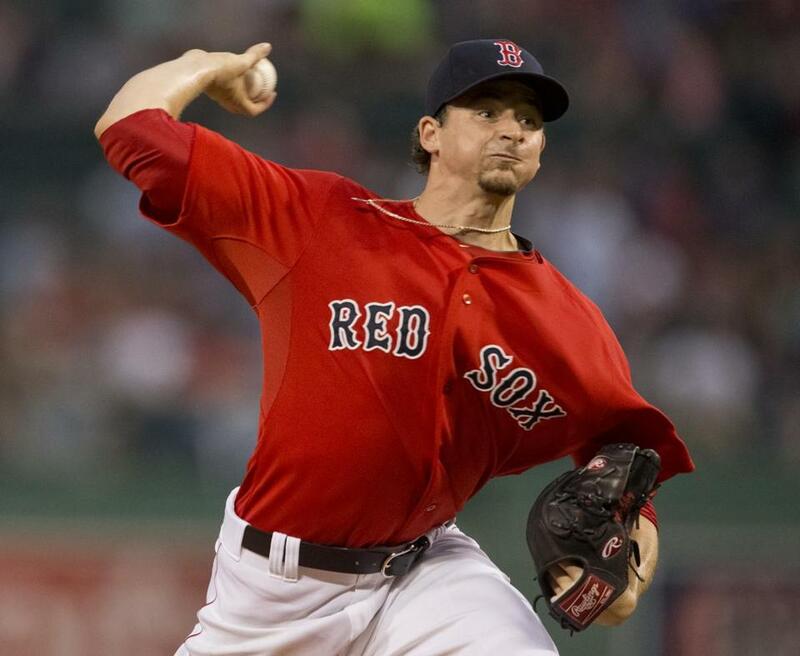 The Red Sox went outside the organization to acquire Rick Porcello, Joe Kelly, Wade Miley, and Justin Masterson. They didn’t have a homegrown option whom they deemed clearly ready for a big league rotation spot. Thus continued a pattern that has had huge implications for roster construction. From 2006-08, the Red Sox looked like an organization with an assembly line of potential rotation weapons. Future All-Stars Jon Lester, Clay Buchholz, and Masterson debuted in a 24-month window, and it appeared the Sox had more reinforcements on the way. The reinforcements haven’t come. Aside from Felix Doubront, a 2005 international amateur signee who showed promise but ultimately pitched his way out of the rotation and out of town, the Sox haven’t gotten a single full season in the rotation from a graduate of their farm system since Buchholz’s emergence. Pitchers such as Michael Bowden (two starts), Kyle Weiland (5), Anthony Ranaudo (7), Daniel Bard (10), Brandon Workman (18), Allen Webster (18), and Rubby De La Rosa (18) all had flickering auditions that failed. Others such as Casey Kelly, Stolmy Pimentel, and Drake Britton never made a start for the Sox in the big leagues. While the Red Sox have struggled to develop and integrate starters from their farm system into their rotation in recent years, the team believes it has a group of pitchers at Triple A Pawtucket that is capable of altering that pattern. Read: Where have all the young arms gone? The result? A team that prizes pitchers on the right side of a 30-year-old fault line hasn’t developed any with staying power this decade. Whether due to a draft focus on position players, trades, or development paths that plateaued, the Sox have been unable to bolster their rotation from within. The Sox are hopeful that they stand on the cusp of changing the dependence on pitchers from outside the organization. At Triple A Pawtucket, the team features an impressive group of pitching prospects who are close to ready to help in a big league rotation, with the possibility of growing into roles at or near the front of it. 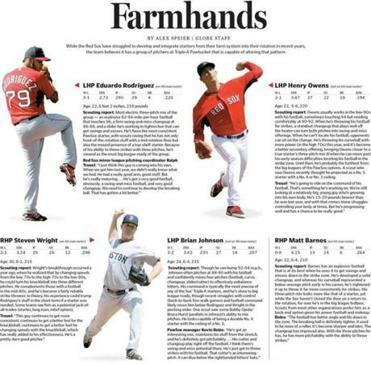 Lefthander Eduardo Rodriguez looms at the top of the list, a pitcher who might possess dominating stuff and the willingness to work inside to create some very uncomfortable at-bats. Fellow lefties Brian Johnson and Henry Owens are both considered students of the art of pitching whose ability to change the speeds and shapes of their offerings while creating deception should help them carve out futures as big league starters. Team officials still believe that Matt Barnes, though shifted to the bullpen on Wednesday, has a chance to develop into a righthanded starter with power stuff given the development of his three-pitch mix. And Steven Wright, though less heralded, has performed in the big leagues in a fashion that makes him a trusted option in a number of roles. In quantity, the Sox believe this group is unlike anything they’ve had for years. In quality, the team hopes there is the possibility of creating the impact that’s been missing. The presence of so much promise in Triple A, at a time when the big league rotation is struggling mightily, could accelerate that timetable considerably. While the Sox emerged from the firing of pitching coach Juan Nieves saying they didn’t plan on any immediate changes to the rotation, the level of talent in Triple A and the struggles in the majors are such that the importance of what’s happening in the Pawtucket rotation is immense.